Welcome to the Lucky 7's. While the 7's are also a member of the "Meanie" family, don't let your student get discouraged. Their mastery of previous Multi-Facts puzzles has given them the knowledge and framework to be successful. We hope that you and your child are starting to believe us when we say learning can be fun! 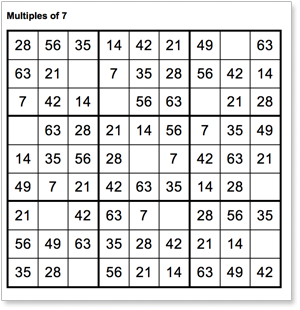 Almost every advanced mathematical operation, such as algebra and geometry, uses multiplication in some way. Kids also use multiplication in real life when keeping score in their favorite sport or baking a batch of cookies. All of these tasks can be much more enjoyable if your child can refer to their multiplication facts quickly and easily & Multi-Facts puzzles will help them to do that!